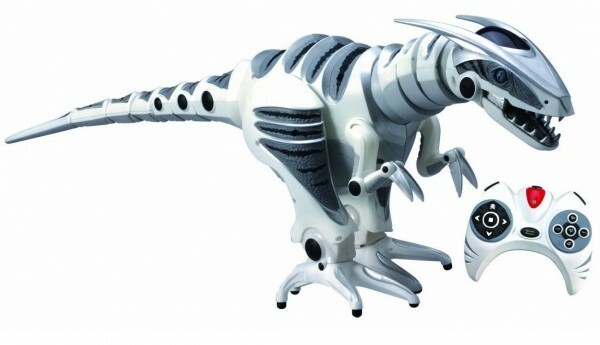 WowWee Roboraptor has come to life and is ready to take over your house. The 32″ long Roboraptor has three different moods, cautious, playful and of course hunter. Roboraptor has jaws that can bite, pull and even play tug of war. His cautious, friendly and aggressive modes add a touch of realism to this robotic dinosaur which has touch sensors, sonic sensors, and infrared sensors and 40 preprogrammed functions. WowWee Roboraptor Robotic Dinosaur comes with mixed reviews. Some absolutely love this robotic dinosaur others think it’s a paperweight. This is a toy, albeit a sophisticated one so if you are after a replacement for a puppy you are going to be disappointed. We think provided you have realistic expectations the WowWee Roboraptor makes a fun and interactive dinosaur toy.